Are more concert tickets being sold (more attendance) or is it just that ticket prices have been jacked up? Are artist revenues up, or are they failing to remove expenses off the other side, which were formally paid by others (not artists, not their revenues)? 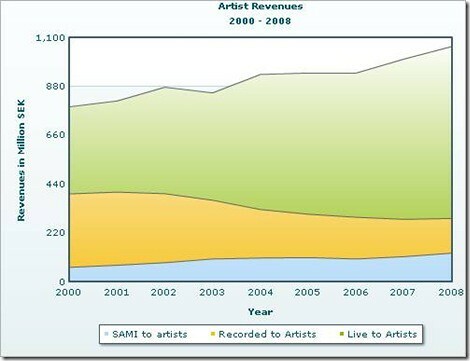 Essentially, where are artist NET revenues? It also appears that, just like the UK numbers, the actual live and record is flat or down over the period. Is this the case? Why would there be no increase even considering things like inflation and such? It would appear that the music industry, for all the "innovation" out there, is essentially flat (and down from a peak in 2002). "Are more concert tickets being sold (more attendance) or is it just that ticket prices have been jacked up?" Either way they are making more money. If prices went up but people still pay means that the music has gotten better. "Are artist revenues up, or are they failing to remove expenses off the other side, which were formally paid by others (not artists, not their revenues)? Essentially, where are artist NET revenues?" That is what is shown in the second graph. The amount of money to artists has gone from just 880 to almost 1100 millions of SEK. "It also appears that, just like the UK numbers, the actual live and record is flat or down over the period. Is this the case? Why would there be no increase even considering things like inflation and such?" I think you got confused with the colors like I did. Live is blue in the top graph, but green in the second. It looks like live to artists is WAY up. While recorded to artists is down and SAMI to artists is up a bit. "It would appear that the music industry, for all the 'innovation' out there, is essentially flat (and down from a peak in 2002)." That might be because in 2002 there was a huge spike in recorded, but the other two continued to grow steadily. It may be because of a balance has not been met. Recorded will probably decline still while the other two continue to grow. Over time it will be a higher overall income, but for now it is more stagnant because of change. I just found out that the first iPod was released in October 2001, with how big that has grown that might be why recorded would hit a peak in 2002 before everyone who had an iPod was file sharing so regularly. There is no indication that the second graph indicates net income, just gross. Basically, if artists are making more money up front (gross) but are then paying management, promotion, marketing, and other costs off the back side, what are they actually seeing net? Basically, is it a money in, money out sort of a thing? If what they were getting before was a NET after everything, of course the gross would be bigger, no? Also, there is no indication as to the number of acts this money is distributed over. There is no indication as to the "high and low" of the numbers. What percentage of the income is made by a small number of artists? Also, there is no indication if there has been a change in the live scene landscape. Have their been more pricey festival type shows? Has there been a regulator change that has allowed more live music in clubs, example? Has their been a shift in the country from recorded (dj) music to live music? Simple graphs don't answer the questions. However, one thing is clear - net, the consumers are not spending any more money on music today than they were 10 years ago, not in the UK,and not in Sweden either. I concur, there's no indication that the net live touring revenue per artist is up. Higher artist live revenue could indicate substantially higher performance costs at the locations -- in the USA tours are getting shockingly expensive as liveNation etc continue to take larger and larger cuts of an artists' gross tour figures. The graphs clearly show that artists are receiving more income from music. I fail to see why artists' live revenue would be directly proportional with performance costs; fans pay based on marginal value, not on the overhead for the artist. So even if you were right and venue costs have gone up for bands, that has nothing to do with either revenue or file sharing's impact on revenue. Here's what has happened in the US. "In 1982, the top 1% of artists took in 26% of concert revenue; in 2003 that figure was 56%. ... The top 5% of revenue generators took in 62% of concert revenue in 1982 and 84% in 2003. While I completely agree that without the Net numbers, we can't really determine if the artists are making more, I find it amusing that you choose the side to reflect higher costs and lower profits (the side of the music industry). Couldn't it just as easily be lower costs to perform and even higher profits? I agree we can't determine either way, but you only mention one way. Just a little food for thought. While it is true that the graph does not indicate that it is net income, it also does not indicate that it is gross income, so your own argument is equally disingenuous. If one cannot argue it one way, then you cannot argue it the other. Either way, the graph DOES show that MORE MONEY is coming in. Period. Arguing semantics does not help your cause. I really wish people would quit picking on Lobo Santo. However, it is somewhat telling of how some people are to getting their feelings hurt. Tell me, Ferret, as a child, did your dad touch you in funny places? I didn't mean it as picking on Lobo Santo, I thought I had something to add to the conversation and turns out he was right after I looked more closely. I don't usually do this, but I would also wonder: What would the graphs look like if you expanded them back say another 10 or 20 years, to the pre-file sharing times? Might we see an industry that was in constant, long term growth suddenly cut off like a hedge? "I don't usually do this ... "
And please try to find numbers back into the 80's so we have a good pre-p2p baseline. I strongly suspect the curve goes UP as people discover more music and I'd like to see a graph that confirms it. This is of interest. I am worried about the connections between an ugly couch, an ugly mom, an ugly goldfish and an ugly ferret. If you were abused ferret, we can get you out of that situation. But the first step is for you to realize it doesn't make it right for you to abuse Lobo Santo in the process. 1. Ticket prices keep going up, and the Bands dont get most of that money. 2. If we had a stadium that could handle 1million people? could they fill it? 3 million show'd up in moscow for a Concert by JM Jerre'. 3. Digital security on music is stupid, it doubles the price and stops NOTHING. 4. AVAILABILITY and finding the MUSIC you like are the MAIN reasons to FIND illegal music. We arent all 16 years old any more. 5. IF the recording industry UNDERSTOOD the idea of DIGITAL music, and would augment their SYSTEM, they could make it cheaper and easier to release music. You could use a KIOSK system and the customer could PICK and choose, PAY, and it would Download the music DIRECT to you..and the system could store MILLIONS of music on the system, in a 4x4 BOX, in the FORMAT BEST for the customer. 6. COPYRIGHTS and TIME. the music industry has TONS of music that hasnt seen the light of day for 50+ years.. it should ALL be released to the public domain. ANYTHING over 20 years SHOULD be released..
first, how exactly do you think you are going to be able to see a clear accounting to get the net numbers in the first place? do you really think that the labels are going to make those numbers available? with 30 years of artists popping up here & there saying they are getting the shaft by their label and the recent proof of extremely shoddy (and i still say completely illegal) accounting methods only an idiot would trust any numbers they gave without having them independently verified by some other means. It isn't a question of making up numbers, but rather trying to get an apples to apples comparison. If the artists were getting X, but it was net of everything, and now they are getting Y, but it is before expenses, then how do you compare the numbers? Artists claim they get shafted, the labels lose their shirts on about half of the advance money they put out, and yet everyone gets rich and famous? Hmmm. Most often artists get "shafted" by themselves, signing away publishing rights, giving away song writing credits, and so on, all because they want on the gravy train so bad they don't care the price. how exactly do you think you are going to be able to see a clear accounting to get the net numbers in the first place? do you really think that the labels are going to make those numbers available? The labels wouldn't be the ones to have the concert income numbers. Those would come from the artists and their managers. It seems that here is a clear-cut business model for artists - WORK FOR A LIVING. The problem is that record company executives aren’t making as much! No, the problem is all wrong. Who cares about musicians? They aren’t the ones who are suffering! It’s the big recording executives! You think these executives can get by when their chattel are allowed to give away their music? Facts about musicians completely misses the point the record companies are trying to make. They are the ones suffering and no one cares! Have some compassion! The data for those who want to create other graphs. these specific companies, the over all trend correlates well with the STIM figures. though, is that the overall trend is in compliance with the STIM figures. have a successful carrier as well as a substantial back catalogue of recorded music. Interesting! The report itself draws a similar conclusion to some of us, that the lower end still isn't making a living at it. Further, there are other quotes mentioning the signficant changes already in 2009 (music sales revenues up 18%, digital sales up 80%), which suggests that piracy had a very significant and clear negative impact on music sales. 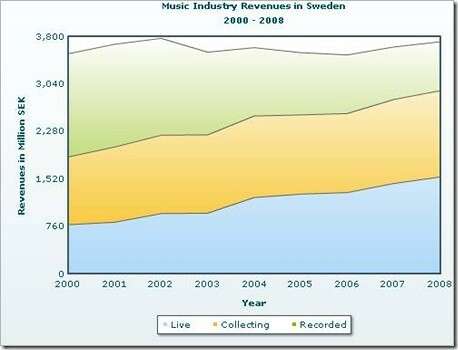 With the IPRED and other moves in Swedish law, suddenly people are paying for music again and recorded music revenue is way up. Mike, would you say that this is an indication that not only to people value music, but they are obviously willing to pay for it when they can no longer safely and easily download it for free? Well, the creators of the report has done a very good job assembling interesting data. They haven't done such a good job interpreting those data. And the report is full of unsupported claims and guesswork. Such as the part you just quoted. They have abolutely no data to support what they say in that quote, since they haven't investigated it. Just on the basis that they raise these issues is an indication that there is something to look at further. Mike tried his damnedest to try to make it sound like anti-consumer industry tactics were to blame, and buried the massive increase in sales in the body of the text. The real headline was the rapid uptick in music sales as soon as people realizes they couldn't infringe with impunity. Seeing sales up 18% overall and 80% increase in digital would be headline news if it went the other way. Most importantly, it would at least for 2009 signficantly reverse the trend and indicate that piracy has a significant impact on sales. Or maybe the fact that the sales increase coincided with huge cuts in interest rates for housing-loan, means that many Swedish consumers, especially in big cities, suddenly found themselves with lots of more money to spend on music. Its common to have housing-loans with 1-3 months market adjusted interest rates in Sweden so interest rate changes has a very direct effect on consumer spending. And the 80% increase in digital is just what to expect when you look at the trend in buying patterns over several years. The report fails to look at those factors. 1. There is a rapid change in consumer spending away from recorded music towards live performance and the overall spending by consumers is mostly constant. 2. Artists are getting a larger share of the revenue and recording companies less. Its unclear if the artists net income is rising but its very clear that this means more of the music industries revenue is in direct control by the artists themselves and not in the control of recording companies. This means a huge shift in power within the industry. Its a pity that that the authors don't focus on analyzing this very interesting fact, which they are the first to actually confirm with solid data, and instead spend a lot of the report repeating unverified claims made by the recording industry. you wrote: "Further, there are other quotes mentioning the signficant changes already in 2009 (music sales revenues up 18%, digital sales up 80%), which suggests that piracy had a very significant and clear negative impact on music sales." um no it doesn't suggest anything about piracy any more than it suggests that better music was released and people decided it was worth purchasing...or even that as more files were shared..more got to "try before you buy" and then went on to buy more of the music they liked..
See how easy it is to "suggest" ? except I don't spout it as proof of anything unlike you and your completely transparent agenda. Go sell your brainless crap elsewhere. Raybone, the only crap is the stuff covering your eyes and keeping you from accepting what appears to be a reality. for 8 years, sales of recorded music went down. There is nothing to suggest that any single artist or whatnot could suddenly change the course of the music industry overnight. However, IPRED and other parts of Swedish law came alone, TPB lost it's case, and "suddenly" people are paying for more music, and significantly, the sales of digital version almost doubles. Now, you can "suggest" all you like about a sudden burst in quality of music, and you are welcome to it, but it isn't supported by what is out there. Swedish law changed, it is much more difficult to P2P legally, the cloak of anonymous is more easily pierced, which makes it harder for people to "hide" online. "but they are obviously willing to pay for it when they can no longer safely and easily download it for free?" Reality called, it wants you to notice it. I noticed. Perhaps you want to read the report, moron. That's interesting to read, ad definitely warrants further investigation. The TechDirt "Relevant Omission" strikes again! Does this matter? The artists are still able to get many times higher income than most people, even though what they do, does not contribute to society. Pure entertainment should not be this rewarding.